[Image: A collage of various buildings by Robert Scarano, from photos by Gabrielle Plucknette for the New York Times]. It’s the summer of 2008. A young couple decides to buy an 800-square-foot apartment in a new condo building on the gentrifying outer edge of a fashionable Brooklyn neighborhood. The buyers go to close on the place, and as they’re signing away half a million dollars, the building’s developer, keeping a wary eye on the hovering lawyers, leans over and whispers something. There’s a second bathroom in the apartment, he says, one that does not appear on the floor plan—its doorway is concealed behind an inconspicuous layer of drywall. At first, the buyers think the developer is kidding. This is before the crash, near the peak of the market, and no one’s giving away a square inch. But the developer says no, he’s dead serious, just look. So a few days after they buy the place, the couple takes a sledgehammer to their wall. Like something out of House of Leaves—or a kind of architectural Advent calendar, in which various walls are knocked down at specific times of the year to reveal whole new rooms and corridors behind them—the building contained more space than its own exterior had indicated. I have to admit that this totally blows my mind. Imagine another room within that room whose doorway is also sealed behind drywall—and then other rooms within that room, and further corridors and stairs and entrances. Tap, tap, tap—you navigate by sound, knocking deeper and deeper into an architectural world you only reveal by means of careful deconstruction. Amidst this labyrinth of drywalled rooms, you realize the true extent of your property, which extends so far beyond what you originally thought was your building that you end up, at one point, standing in another zip code. [Image: The underground city of Derinkuyu]. I’ve long been a fan of David Knight and Finn Williams, two London architects with an encyclopedic knowledge of that city’s building permissions and zoning codes (I highly recommend their book SUB-PLAN: A Guide to Permitted Development, as well as Knight’s recent guest post on Strange Harvest). The following image, taken from that book, is just one example of the type of interpretation-based spatiality so often abused by Scarano. 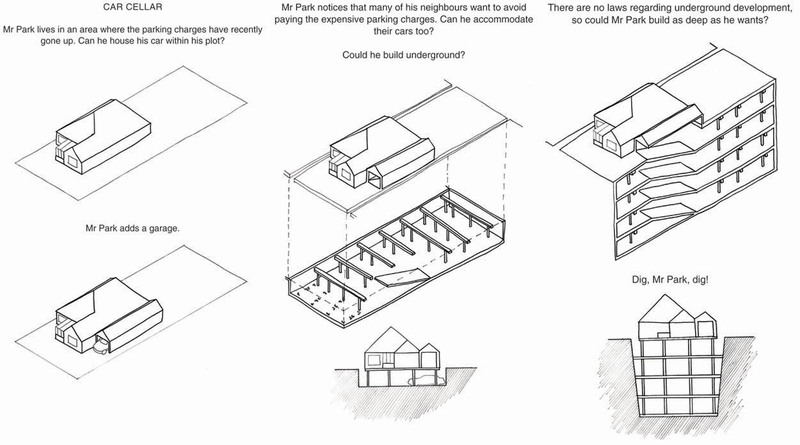 [Image: From SUB-PLAN: A Guide to Permitted Development by David Knight and Finn Williams]. Whether or not hiding entire rooms behind drywall is part of London’s “permitted development” is something we’ll have to ask Knight and Williams. (Thanks to a tip from Nicola Twilley).